Your Guide To Drinking This Weekend: The Ramos Fizz | Birth.Movies.Death. 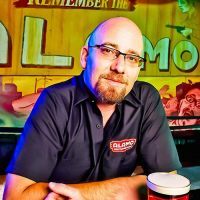 Alamo Drafthouse Beverage Director Bill Norris delivers the history and recipe for a perfect Ramos Fizz. If the Sidecar is jazz, the Ramos Fizz is ragtime…Henry C. Ramos's creation is a matter of poise, of balance, of delicacy. This isn't a drink to throw together from whatever you've got lying around; every part of the formula is crucial. The egg white gives it body, the cream lends smoothness, and the citrus provides its cool. The sugar tames the citrus, the gin does what gin does, and the seltzer wakes the whole thing up. As for the orange flower water -- that's for mystery. To sip a Ramos Fizz on a hot day is to step into a sepia-toned world peopled with slim, brown-eyed beauties who smell of magnolias and freshly laundered linen, and tall, mustachioed gentlemen who never seem to work and will kill you if you ask them why. Few drinks are more counter-intuitive than the Ramos Gin Fizz. Heavy cream, a couple of kinds of citrus, perfumed orange flower water, a raw egg white, some gin, sugar and well charged fizz shouldn’t be this light. It shouldn’t be this refreshing. It shouldn’t be so soothing to a stomach laden with the previous night’s excess. It shouldn’t be good. But it also isn’t easy. Be wary of ordering this cocktail in any but the best bars, unless you happen to be wandering the streets of New Orleans, where even some middling bars can put out a passable Ramos. This is a drink that requires precision, and no small amount of muscle, but like much that requires effort, the rewards are great. The basic formula for a sour, any sour, is simple. A slug of spirit, some lemon or lime juice, some sugar, and if you’re going about it properly, an egg white to give it that fluffy head and smooth body. Sours have been around since the 19th Century, and Fizzes just as long, because as cocktail savant Dale Degroff has noted, the Fizz is just a sparkling sour, lengthened with seltzer or club soda. They are nice indeed on a hot day, as anyone who has ever sipped a Tom Collins can attest. But things get interesting when you start plopping in egg parts. The Silver Fizz was popular by 1883 and was simply gin, soured with lemon, a bit of sugar and an egg white, strained into a tall glass and topped with sparkling mineral water or seltzer. Use egg yolk in place of the white and, if you’d prefer, swap in whiskey for the gin, and you’ve got a Golden Fizz. Want a Royal Fizz? Use the whole egg. Take that whole egg, use brandy for your spirit, add a bit of lemon, a couple of dashes of bitters and a few more of absinthe, top it up with soda, and you’ve got a Saratoga Brace-Up, which is particularly fine when you’ve taxed your system extensively the night before. We find foams as trendy additions to food and drink menus everywhere, but you don’t need an iSi whipper, agar agar or bloomed gelatin to make a foam for your drink. You just need eggs. In many classic cocktails, eggs are an important part of the recipe, providing unmatched texture and mouth feel. Flips, the first egg based drinks, started to appear as early as 1690. These drinks aren’t just pre-prohibition, they pre date the United States as a nation. As bartending moved forward egg drinks were often morning eye openers - adding a little protein and vitamins to the drinker’s morning booze. Egg whites add texture, volume and create a beautifully thick, foamy head on the top of a drink. Yolks add richness and a voluptuous silky mouth feel. But, sadly, eggs largely disappeared from the bar for a long time and the US government has done more than a bit of fear mongering about raw eggs and other ingredients. Despite the warnings about raw eggs, according to the FDA only 1 in 20,000 eggs has the salmonella bacteria, and it takes at least three to five weeks for salmonella to develop in eggs. You have a better lifetime chance of dying from accidental drowning (1 in 1,000), perishing in a storm (1 in 3,000) or dying after slipping and falling (1 in 6,500) than encountering a salmonella tainted egg. The National Safety Council's has no data that suggests raw eggs are a common health risk, and you’re more likely to choke to death on your food (1 in 5,000) than you are to get salmonella from a raw egg. The average consumer encounters a contaminated egg once in 42 years, and there’s one outbreak of salmonella for every one billion eggs consumed, worldwide. Even better for our purposes, salmonella lives primarily on the outside of the egg, and is transferred to food by handling. If you’re really worried about using eggs, the best possible for use for vodka is to rinse your eggs before using because any alcohol over 8% by volume (a mere 16 proof) will kill salmonella. Better still, sugar, extreme cold and any ph lower than 5 can destroy salmonella. When you combine booze, citrus juice, sugar and ice in a shaker with all or part of an egg, every element you’re using kills salmonella. Want to be even safer? Don’t buy factory produced eggs. Support your local farmer’s market egg vendor.They’ll taste better when you cook up an omelet anyway. What about flavor? Egg whites alone add very little flavor to a drink - why? Because egg whites are as much as 95% water - and what’s not water is basically flavorless protein that is transformed by shaking into a fluffy texture in a glass. Yolks will change the flavor of a drink, but the proteins are similar and the resulting flavor is creamy, not at all “eggy” in the way your breakfast tastes and, often, simply delicious. Those powdered egg whites they sell in some liquor stores? Avoid them. The Ramos Gin Fizz began its life as The New Orleans Fizz, circa 1888 in the hands of Henry C. Ramos at New Orleans’ Imperial Cabinet Saloon, but didn’t hit its stride until about 1907, when Ramos moved operations to the Stagg Bar, opposite the St. Charles Hotel. Ramos carefully guarded his recipe until the onset of prohibition, when he allowed it to be published, either to immortalize his contribution to the vanishing world of bars and saloons or to tempt would be imbibers to break the law in pursuit of his creation. But let’s get back to these shaker boys. Anyone who’s done a bit of baking has probably soured milk at some point by adding a bit of lemon juice or vinegar to the mix. It is a reliable stand-in for buttermilk in some recipes, but simple chemistry tells us that acid plus dairy equals curdling. Our taste buds tell us that curdled dairy tastes rancid. But the Ramos Fizz is a drink that calls for heavy cream mixed not only with acidic citrus, but also with the goop of a raw egg white - somehow, we have to get those ingredients combined and in harmony, and the only way to do that is some serious kinetic energy - we need to shake like hell. Contemporaneous accounts from The Stagg say that bartenders would build Ramos’ fizz in the cocktail shaker and pass it along to the shaker boys who would have at it for a good fifteen minutes before the drink was strained. Later, the line of shaker boys would shake until they were tired and then pass the mixing tin off to the next in line. We can assume that there is more than a bit of hyperbole here, but you do need to shake, as Ramos put it, until the drink feels “ropy” in the shaker. With a good, hard shaking motion, we’re looking at a couple of solid minutes of back and forth with the ice here, and, while that ropy texture is difficult to describe, you do know it when you feel it. All that shaking emulsifies the egg white, smooths out the curdled cream and makes the whole package voluptuous and unforgettable. For the gin, Ramos would’ve used Old Tom, and if you can lay your hands on a bottle of the Hayman’s, it works quite nicely. But, because Old Tom Gin is slightly sweetened, watch the sugar. Plymouth is great here, and the modern standard choice. Orange flower water though, is more problematic. It is the perfumed distillation of bitter orange blossoms and widely used in both Mediterranean and Middle Eastern cooking, especially in desserts. It is also incredibly powerful stuff. A little goes a very long way, and if you overdo the flower water by even a little, your fizz will taste of your great-gran’s vanity, overly perfumed and undrinkable. Put the stuff in a dropper bottle and measure carefully. A. Monteux is a good brand, and Mediterranean or Middle Eastern groceries are a good source. Aside from shaking the bejesus out of the Ramos Gin Fizz, it is traditionally served in a Collins or Zombie glass of about 14 oz. without ice. Many recipes call for serving drinks in chilled glassware, and your better sorts of bars typically keep glassware in a freezer or, at the very least, chill them with ice water before using. This is not just for show. Drinks properly shaken with ice come out of the shaker tin between twenty and thirty degrees Fahrenheit. When strained into a room temperature glass, the temperature of the drink can rise as much four degrees in under 300 seconds. Chilled glassware keeps your drink colder, the way it is meant to be tasted, longer. Chill your glasses. Combine all ingredients in a mixing glass and shake without ice for one minute to begin the emulsification of the egg white. Add plenty of cracked ice and shake long and hard until the drink starts to feel ropy in the glass, at least another minute, preferably two. The shaker should be cold enough that it is painful to hold. Strain into an un-iced, chilled collins glass and top with fizzy water until the glass is full. There are recipes out there that say to use a blender or immersion blender to start this drink. It will save some time, but the reward is in the effort. Shake and shake some more. Then Enjoy. *Arthur, Stanley Clisby. 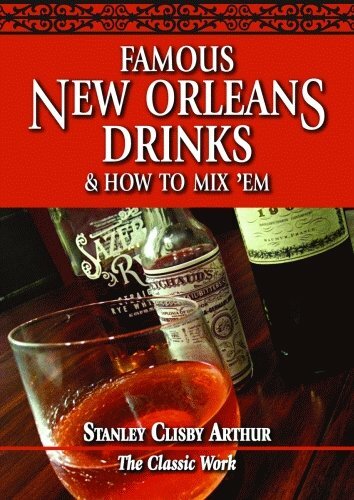 Famous New Orleans Drinks and How to Mix ‘Em. New Orleans: Harmanson, 1937.